to any serious Bible student. found teaching. He had heard Jesus speak to the crowds. being used by Satan for even greater evil. even in the worst possible events. also mentioned in Acts 1:18-19. “man from Kerioth,” came from an area known for its ultraconservative and zealous ­mind-­set. nation of Israel. 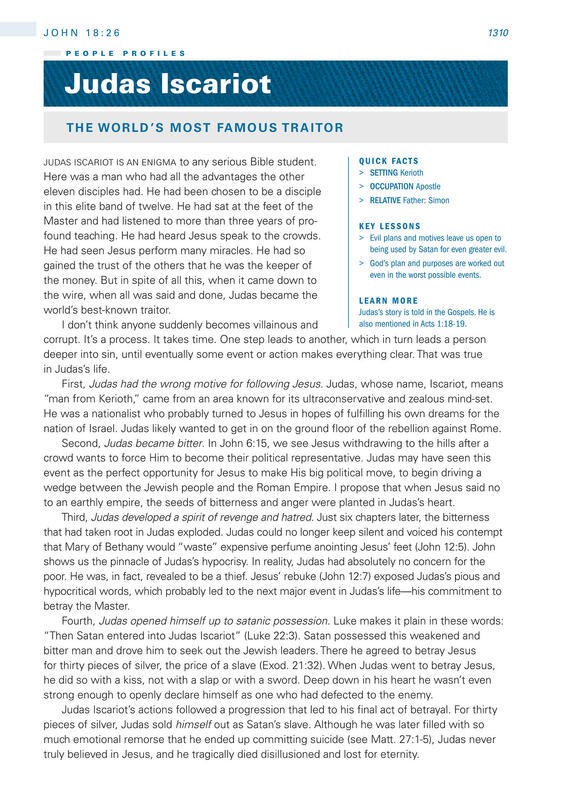 Judas likely wanted to get in on the ground floor of the rebellion against Rome. to an earthly empire, the seeds of bitterness and anger were planted in Judas’s heart. strong enough to openly declare himself as one who had defected to the enemy. truly believed in Jesus, and he tragically died disillusioned and lost for eternity.